With the 2018 midterm elections right around the corner, political discussions (and in many cases, debates) are picking up steam. Whether voting as a Democrat, Republican or Independent, there’s one thing we can all agree on: Political debates can become painfully uncomfortable in the workplace. Allow employees to express themselves, as long as it’s done respectfully. Be prepared to discipline disruptions but don’t punish perspectives. Managers need to lead by example on acceptable political expression and activity. For example, you can help establish a positive environment by discussing political matters diplomatically. Share your thoughts, but present both sides of the situation so it’s clear you’re aware of different perspectives. Your employees will see that you have your own opinions, but that you allow for other points of view, as well. R-E-S-P-E-C-T is vital when talking about politics. With everything going on right now, certain topics are difficult to avoid. Allow employees to express themselves, as long as it’s done respectfully. Be prepared to discipline disruptions but don’t punish perspectives. There is nothing wrong with coworkers having a discussion, but interactions that cross the line into political harassment are unacceptable. The best way to prevent workplace disruptions is to educate your employees on proper behavior. For example, encourage employees to excuse themselves from any uncomfortable political discussions with coworkers and to keep controversial opinions to themselves. If you encounter or learn of a situation that crosses the line into harassment, however, follow the same disciplinary process you would with any other inappropriate behavior, such as verbal counseling and written warnings. When in doubt about how to handle a situation, always refer to company policy. Freedom of expression is essential — especially if you want a workplace that honors diversity and encourages creative ideas. However, having an established policy limiting political expression and activities can help prevent conflicts and even employee lawsuits. 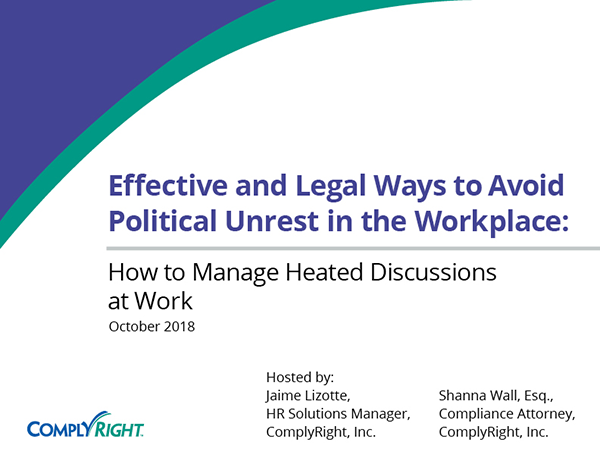 Develop a policy that outlines workplace rules (for example, “company email may not be used to engage in political activities”) and prohibited employee activities (for example, “you may not make political statements to customers during work hours”). Include phrasing that supports your company’s zero-tolerance stance against coercion, harassment and retaliation. And make sure every employee signs and dates the document. You should permit employees to participate in midterm elections. This includes allowing them to take time off from work to vote if they’re unable to do so before or after work hours. Keep in mind that state laws vary on the reasons employees may take time off from work to vote, the amount of time they may take and whether you must pay them. Remember, too, that it’s never okay to force employees to support a particular political party or candidate. 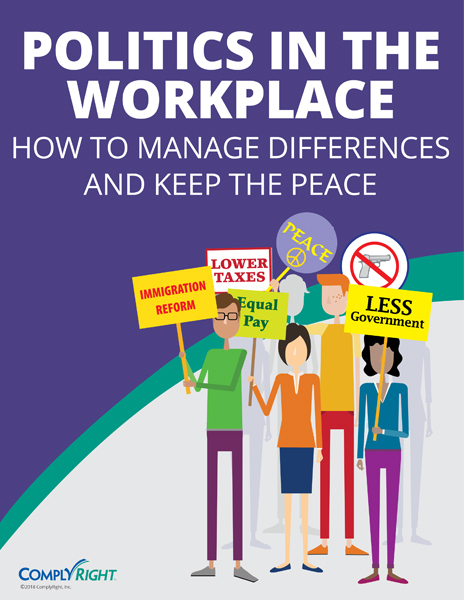 Every employer should have a legally sound handbook covering essential policies, including political expression in the workplace. Gradience Handbook Manager software makes it easy to create and update a handbook in a few simple steps.